For as long as I remember, the geese have come to visit each winter. I haven’t seen them in the past few years as I’ve spent time away from home in winter, at university or working in different places. This year, I am reluctantly home much earlier than anticipated, recovering from an illness that meant I had to temporarily give up my studies and my favourite city and my LIFE (I am a big fan of the amateur dramatics at the moment) till next year, and as a result I have spent quite a few weeks being furious at the universe. This is a tiring and altogether pointless exercise that I have clung to nonetheless, because: everyone likes to have someone to blame for their troubles; I have a lot of free time to devote to such things; and if you want to pick a fight that is impossible to win, the universe is one of the best opponents out there, what with it being infinite and all (I have been watching a lot of TEDx youtube videos recently and learning things about the universe in order to better prepare for this particular argument, but even if you aren’t planning on waging war on the universe any time soon, they make for excellent, interesting procrastination). This was enough to keep me busy for a while, but it wasn’t much use at making me happier. A few friends have suggested that I write something here instead, and given that the theme is positivity I would like to think that writing something should encourage me to brighten up a little. When contemplating the universe fails to remind you of your smallness (and therefore the tininess of your problems), it’s a clue that something has to change. With that in mind, I started a Pinterest board devoted to choosing my next hair cut, but quickly realised that perhaps that wasn’t going to be enough. On Sunday 7th December 2014 I went walking with my dog, as I often do now, because I need to get rid of some of the calories that unfortunately come hand in hand with eating Nutella out the jar with a teaspoon. One of our favourite hobbies is making the birds fly, because it is quite amazing to look at and it makes you feel weirdly powerful and at one with nature. I am not very good at judging quantity, distance, hairstyles, cooking times for food or best in show at Crufts, so I also appreciate trying to appreciate the sheer number of geese as they take off, amidst feathers, a lot of honking and the beating of thousands of wings. procrastination suggestions? 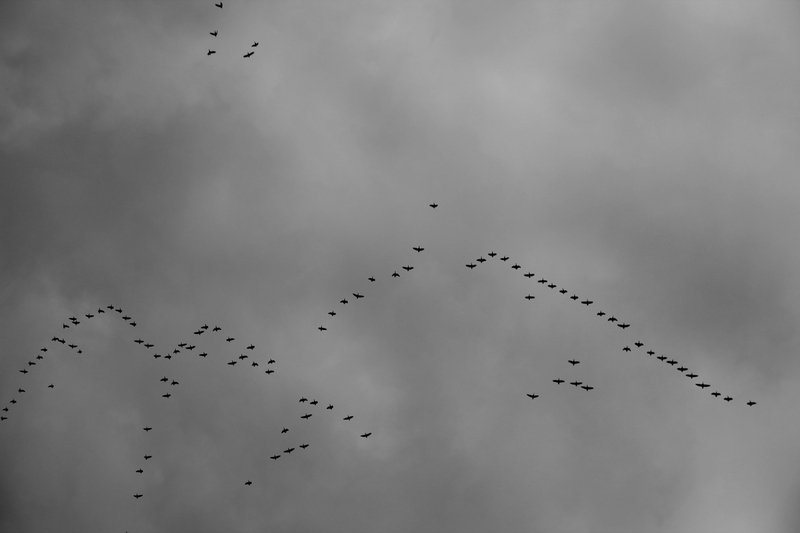 – count the geese in this photo. you’ll be back to the books in no time. I have tried to do a little research about our fowl neighbours. 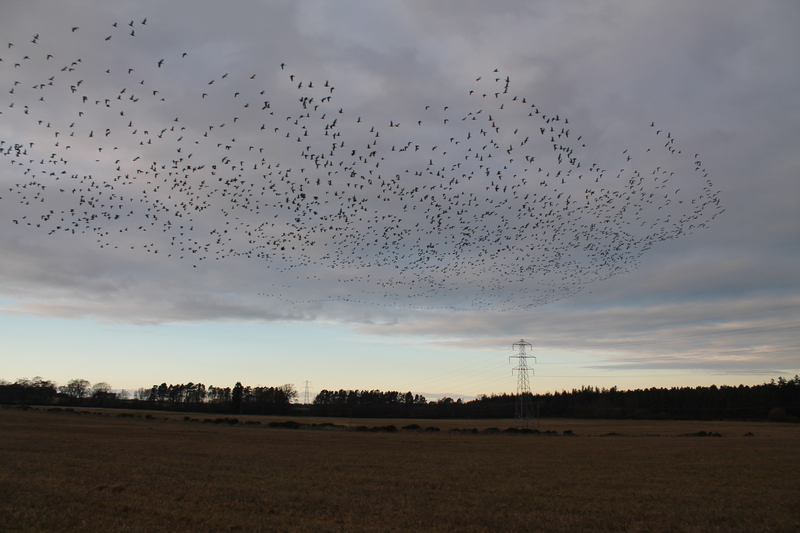 I believe them to be Pink-Footed Geese, travelling each year to the North East coast of Scotland for their Christmas holidays, from Iceland and Greenland. 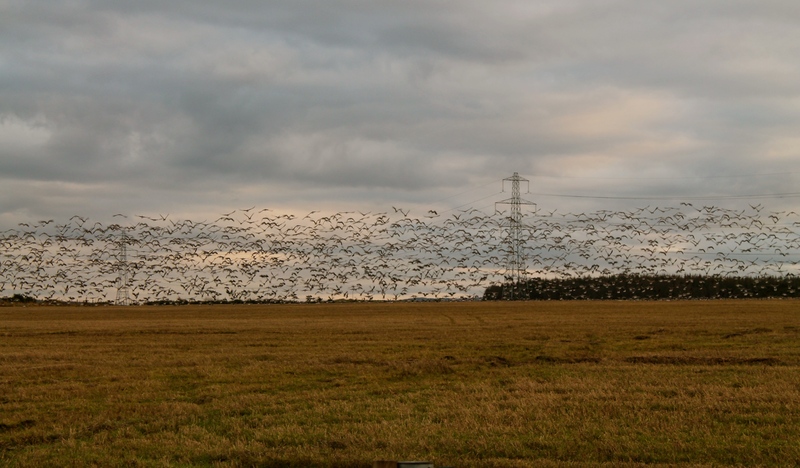 It has been estimated that birds have migrated for 100 million years. Every single year. And here I am taking snaps of them in our back-garden. For an average day in a period of my life where I feel like there isn’t much excitement, that’s actually quite a cool occurrence. Thank you, geese. As I flicked through the images, one seemed oddly familiar and it took a few days to realise why. Weirdly similar. I’m not saying that it’s a sign we should be expecting the zombie apocalypse, that’s a bit much. Although if you are worried, don’t be, because there’s a TEDx video for that. Rather, it just made me curious about other things. And that leads me to the point of this post – curiosity is the cure for the blues. The trick is sparking it when there isn’t a whole lot of obvious inspiration. I got to thinking about the birds and the human events they have migrated around in the last thousand years. I can only find out the famous ones, but wondering about the millions of average folks they may have witnessed on their historical travels is fun too. 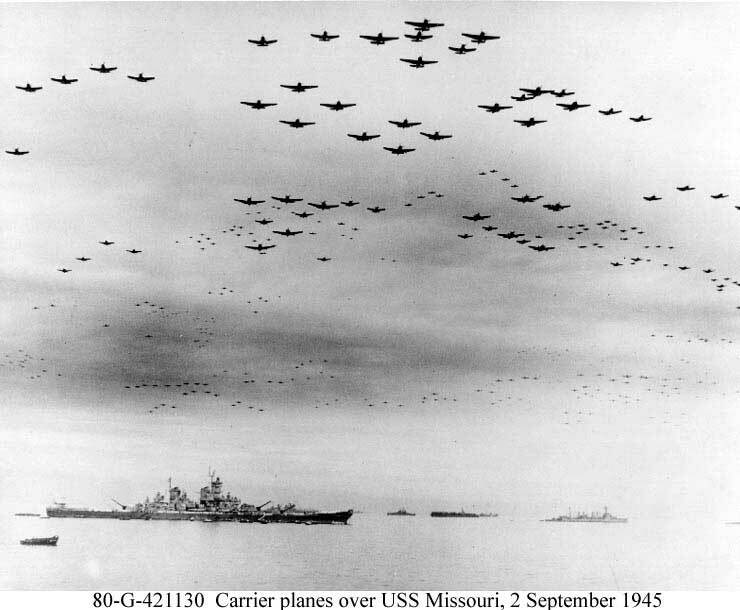 On December 7th 2014, they flew over my head and I took a photo, the co-incidental layout of which led me to the above photograph of USS Missouri in 1945. In researching this post, I decided to discover other things they may have flown over on December 7th of other years. 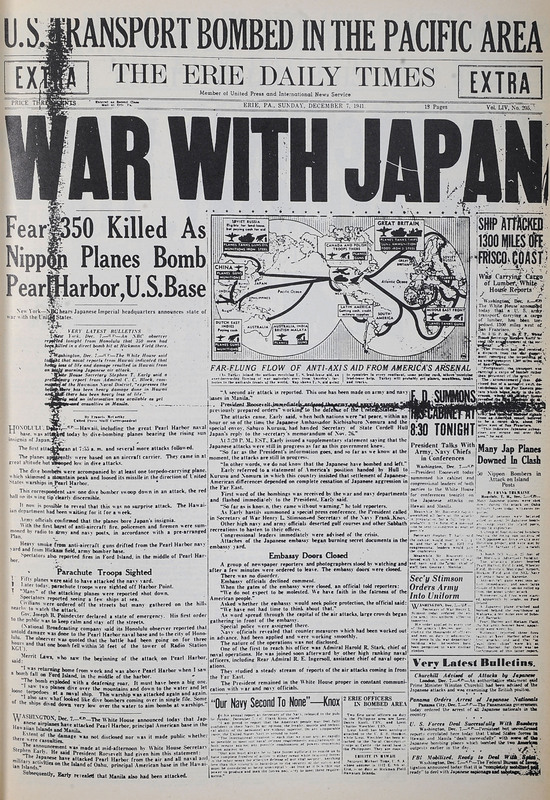 The biggie of recent times was the bombing of Pearl Harbour, on this day 1941. In 1887, on this day, Thomas Edison demonstrated the use of his ‘phonograph’ (gramophone) to the editors of “Scientific American”. Perhaps if he hadn’t, the technology of recording music would have developed very differently and Otis Redding might not have recorded Sitting on the Dock of the Bay exactly 80 years later. Perhaps he then would not have been onboard the plane which crashed and caused his death, aged 26, 3 days later, but all that thought of ‘what if’ is what got me into this blue mood in the first place, so it doesn’t help to wonder too much. In return for this great service, citizens, I shall ask you for no token of merit, no badge of honour, no monuments of praise – except that you remember this day for ever. My achievements, citizens, will be nurtured by your remembering them, will grow by people talking about them, and will ripen by people recording them in literature. Incredibly, he was right, you know. 2057 years later and here I am in bed, reading his speeches and listening to Otis Redding for the first time in my life (and very much enjoying it). For him, and many others implicated in the stories I’ve looked up, December 7th was crucial. For me, the December 7th just passed seemed frustratingly dull and ordinary. Everything seems frustratingly dull and ordinary. But somehow, it is a bit extraordinary to think that a photo of some birds on December 7 2014 led to a photo of a ship, which led to researching a date. Any old date, but it introduced me to some rather inspiring history, a great musician and a reminder from 2000 years ago to remember the important days, and that in itself doesn’t happen every day. Curiosity will cure the blues. And perhaps my most recent discovery; that USS Missouri, the ship from my plane photograph now spends her days in Pearl Harbour as a memorial and tourist attraction for a December 7th of years gone by; was the most curious coincidence of all. Thank you, geese. And be forever grateful for the wonders of the internet.